Whether you’re dating or married to someone in real estate, the truth is you’re in a three-party relationship. There’s you, your main squeeze and the business that’s guaranteed to keep things interesting. Only an agent’s other half will send their mate out into the world looking their best, hoping they come back with lots of phone numbers from interested people. Face it: Someone else’s reason to be jealous inspires your thoughts of a trip to Cabo. In a normal relationship, random numbers or late-night calls would be cause for concern. When you’re with an agent, they mean leads are being followed up with (perhaps using one of these seven online lead follow-up strategies) and business is good. In addition, you know you’re in love when you start answering the phone like you’re the office receptionist and know the qualifying script. In most relationships, weekends mean dates, romance and quality time together. When you’re with an agent, you probably party with your friends or tackle errands more than most. That is, unless you consider attending an open house a hot date. You know the love has gotten real when your vacation locations are centered around the next season’s real estate conference. One of the big benefits of “standing by your man/woman” when they’re in real estate is planning your getaways around continuing education or networking events. Nothing sells faster than a well-staged home. And if you’re paired up with an agent, you know this because sometimes pieces of your well-staged home may disappear. Every relationship is give and take. In real estate, sometimes the give is your favorite lamp or painting. Look at it this way: By utilizing your tasteful furnishings or decorations, your partner is able to avoid committing any of these shockingly bad staging decisions that sellers (and some agents!) have been known to make. Whether it’s the self-pep talk or someone like Brian Buffini on an audiobook, if you’re courting an agent you’ve probably caught them motivating themselves on the go. It’s OK, they aren’t that crazy. Enjoy the hum that gets the deal done. If you have a hard time watching the 30-minute real estate hunts or get a feeling similar to road rage when you flip to HGTV, you might be dating an agent. You know the realities are a lot less pretty, and that’s OK. It just means you’re really connecting with your mate. Agents are special people — to work with, to know, and especially to love. These are our seven signs that you’re dating or married to an agent. 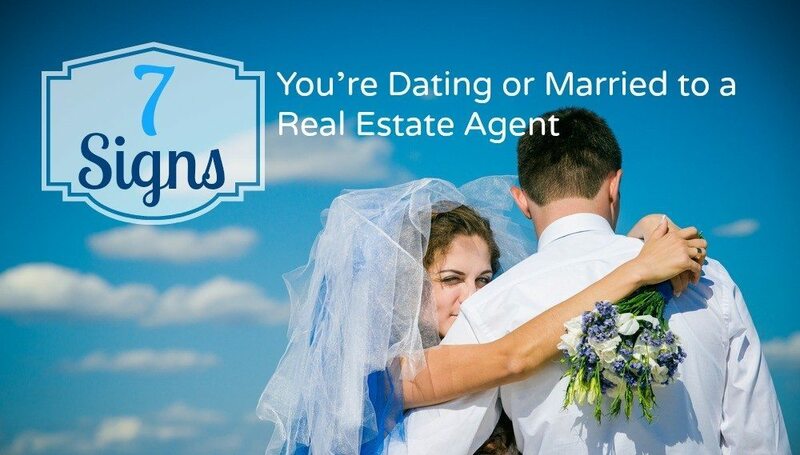 What signs you’re dating or married to a real estate agent would you add to this list? This post was originally published on the Trulia Pro Blog. Follow Trulia Pro on Twitter: @TruliaPro.